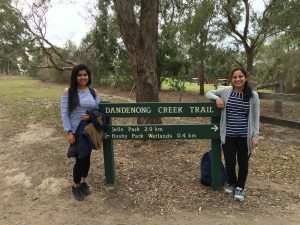 Living Links is excited to welcome two Masters students who are commencing social research projects on ‘Community use and appreciation of the Dandenong Creek corridor’. Working under the supervision of Dr Claire Henderson-Wilson at Deakin University’s Health Nature Sustainability Research Group, Aparna Sethunath (left) and Divya Attaluri (right) will help us understand the barriers and benefits that people experience with regards to connecting to nature along the Dandenong Creek. This will help us develop a more targeted marketing campaign to promote the many health and wellbeing benefits of spending time outdoors in nature, which will be carried out as part of the $1M ‘Transforming the Dandenong Creek Corridor into a world-class urban Living Link’ project. Divya is doing a Literature Review on ‘Community engagement strategies to promote use of the Dandenong Creek’, which will provide some background context and help to identify relevant strategies/interventions that could be implemented to monitor changes in community attitudes. Aparna is developing a comprehensive Research Proposal to monitor changes in community use and appreciation of the Dandenong Creek corridor, which will probably involve surveying users of the Dandenong Creek corridor before and after the marketing intervention is implemented. The students will complete these projects in October this year. We look forward to hearing their results!